The Belles and Beaus square dance club members, along with their guests recently held their annual Halloween party in Cheshire, Ohio. Some of the members dressed up in costumes. Shown here are the members who participated in the competition. Prizes were awarded for their efforts. The evening also included a pot luck meal and square dance lessons. A fun filled evening was enjoyed by all. 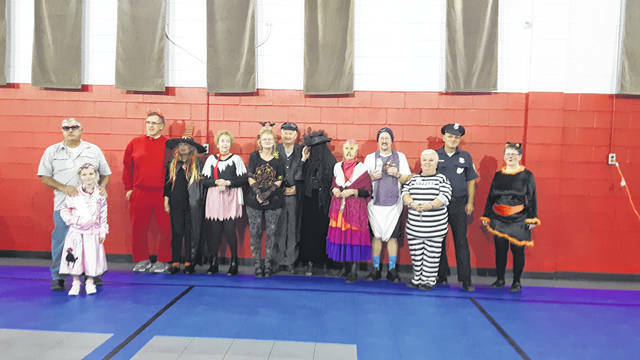 https://www.mydailyregister.com/wp-content/uploads/sites/24/2018/10/web1_1101.BB_.jpgThe Belles and Beaus square dance club members, along with their guests recently held their annual Halloween party in Cheshire, Ohio. Some of the members dressed up in costumes. Shown here are the members who participated in the competition. Prizes were awarded for their efforts. The evening also included a pot luck meal and square dance lessons. A fun filled evening was enjoyed by all.